Medical malpractice laws are designed to allow victims of medical malpractice to obtain justice if they have suffered harm due to a medical professional’s mistake. However, in 2013, the Florida state legislature passed a law that arguably places hurdles in front of patients who need to file these types of lawsuits; namely, by allowing for what’s known as “ex parte communications” between defense lawyers (i.e. lawyers defending the medical professional accused of making a mistake) and prior medical providers for the plaintiff (or patient) on medical issues completely unrelated to the subject of the lawsuit. In doing so, many—including federal judges—have argued that this violates a patient’s privacy. In fact, this was the precise concern of several justices when the Florida Supreme Court heard the appeal questioning the constitutionality of the law on December 8th. An ex parte communication covers any communication between any party to a legal proceeding and any other person about the case. Typically, this occurs outside the presence of the opposing party and/or their lawyer. 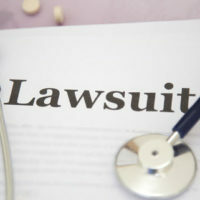 However, as the state Supreme Court pointed out, this particular law allows for the doctor (or defendant’s) lawyers to gather information from other doctors who have treated the patient (or plaintiff), and this treatment could be for issues completely unrelated to the lawsuit’s allegations. In addition, this communication would all take place without the patient/plaintiff’s lawyers being present. Clearly, this law could arguably lead a patient who has been injured by a doctor to pause and potentially be hesitant to bring a case for fear that private medical information could be released. In fact, Justice Barbara Pariente described the law as having a potentially “chilling effect” on malpractice cases. It is also of concern just given how important doctor-patient confidentiality is in patients being honest with their doctors and being properly diagnosed. Not only does the law arguably violate a Florida citizen’s constitutional right to privacy, previous judges have noted that it also arguably violates the federal Health Insurance Portability and Accountability Act (HIPAA), which contains a privacy rule that sets national standards for the protection of information related to a patient’s health. This rule addresses the use and disclosure of individual health information and those entities covered by the privacy rule, as well as a patient’s right to control how their health information is used. As a federal law, the Florida legislature cannot pass a state law that conflicts with HIPAA. In addition, the court also pointed out that ex parte communications are typically decided by the courts and not the legislature, indicating that the Florida legislature may have also overstepped its boundaries in passing this law three years ago. At Friedland & Associates, our lawyers are trained in medical malpractice litigation and have tried hundreds of these cases in Fort Lauderdale and surrounding areas. Few firms have the experience, legal expertise, and medical expert connections necessary to successfully represent clients who are victims of medical malpractice. Contact us today for a free consultation—we’re here to help.